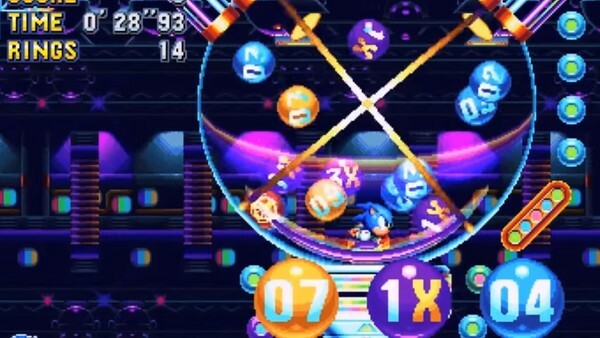 Another supremely slick reference that only the most attentive will pick up on, during the new Studiopolis stage - one of the many where Christian and his team went hog wild with references and fan-nods - you can fall into a bingo ball machine. Said machine then spits out a variety of different balls, but one of the more common combinations that allows you to continue is '3X, 07, 1X, 04', translating to '3x7x1+4', equalling 25. That matters, because Sonic Mania was first announced at Sonic's 25th Anniversary celebrations; an event that in honesty, wasn't the smoothest of things, but Mania's appearance certainly lifted some spirits.